POLWENT offers standard O-rings, simering shaft seals, hydraulic seals used in power hydraulics and pneumatics. We are also an authorized American dealer BrakeQuip dealing with production brake, rubber, teflon and metal lines. Our specialists provide advice both in the selection of seals and in the construction of sealing nodes. For the production of technical and hydraulic sealants we use only materials with high technical parameters. Wires and hydraulic hoses and other products from our offer undergo adequate strength tests. Thanks to this, we are sure that the cables and seals offered to our customers are reliable and durable. We also manufacture special products. U 203-R 95 is resistant to PU (H-PU) hydrolysis formed from polyoxytetramethylene glycol (PTMEG) prepolymers and diphenylmethane diisocyanate (MDI) and is processed with catalysts and chain extender giving a hardness of 95 ± 2 Shore A with very good properties physical. 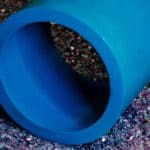 Resistance to most hydraulic fluids and water-oil emulsions makes it a very universal sealing material. Main application: Seals (standard and special), scrapers, lip seals (cable trays), compact, O-ring, O-rings. U 203-G 95 is resistant to PU (H-PU) hydrolysis formed from polyoxytetramethylene glycol prepolymers (PTMEG) and diphenylmethane diisocyanate (MDI) and is processed with catalysers and chain extender giving a hardness of 95 ± 2 Shore A with very good properties physical. 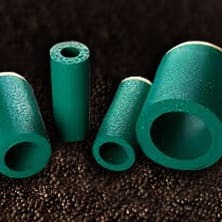 Resistance to most hydraulic fluids and water-oil emulsions makes it a very universal sealing material. Main application: Seals (standard and special), scrapers, lip seals (cable trays), compact, O-ring, O-rings. In 203-FDA 95, blue is resistant to PU (H-PU) hydrolysis formed from poly-epidine glycol prepolymers and diphenylmethane diisocyanate (MDI). The hardness is adjusted to 93 ± 2 Shore A. The products are recommended for continuous use in hot water 70-90 ° C, and the maximum working temperature should be 100 ° C. The system has passed the official FDA test at Akron Polymer Labotatory Inc. - Ohio - USA. Main application: Seals (standard and special), scrapers, lip seals (cable trays), compact, O-ring, O-rings. U 203-D57 (FDA) blue is resistant to hydrolysis of PU (H-PU) formed from polyoxytetramethylene glycol (PTMEG) prepolymers and diphenylmethane diisocyanate (MDI). 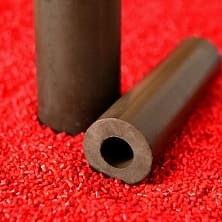 The hardness is adjusted to 57 ± 2 Shore D, which makes it an excellent material resistant to extrusion. Resistance to the most common hydraulic fluids and water-oil emulsions makes this material a universal material for sealing purposes. Main application: Seals (standard and special), scrapers, lip seals (cable trays), compact, O-ring, O-rings. In 203-GM 95 it is resistant to PU (H-PU) hydrolysis formed from polyoxytetramethylene glycol prepolymers (PTMEG) and diphenylmethane diisocyanate (MDI) and is a liquid processed with catalysts and MoS2 polyol behaves excellently in critical conditions for lubrication and reduces the phenomenon of friction vibrations. Main application: Seals (standard and special), scrapers, lip seals (cable trays), compact, O-ring, O-rings. 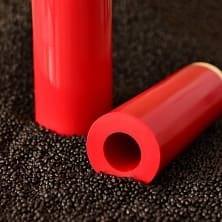 N 107 -B 85 is a black nitrile-butadiene rubber usually called NBR, NITRIL or BUNA. Good physical properties and chemical resistance to most hydraulic fluids make it an exaggerated sealing material. Main application: Seals (standard and special), scrapers, lip seals (cable trays), compact, O-ring, O-rings. HN 112-B 85 is a black hydrogenated acrylonitrile-butadiene gum usually called H-NBR. Good physical properties and chemical resistance to most hydraulic fluids make it an exaggerated sealing material. H-NBR materials are often used for vegetable and animal oils as for easily miscible and crude oils. Main application: Seals (standard and special), scrapers, lip seals (cable trays), compact, O-ring, O-rings. F 109-BR 85 is a brown fluorocarbon elastomer known as VITON (Du Pont) and FPM. FPM materials have very high resistance to hydraulic fluids, chemicals and a certain number of chemical compounds and function at temperatures between - 20 to + 210 ° C. F 109-BR 85 is recommended for applications where exceptional heat resistance, chemicals are required , weather activities and ozone. Main application: Seals (standard and special), scrapers, lip seals (cable trays), compact, O-rings, O-rings and pre-tensioned elements. 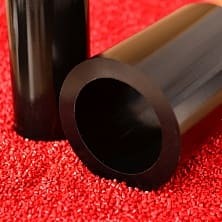 E 131-B 85 is a black ethylene-propylene rubber usually called EPDM. The material is often used in hot water or steam as well as fireproof liquids where synthetic oils are used. EPDM materials are also used in alkaline, acidic and alcohols environments. The use of E 131-B 85 in brake fluids is not recommended and depends on local regulations. EPDM is not a material resistant to mineral, vegetable and animal oils. Main application: Seals (standard and special), scrapers, O-rings, self-sealing rings, O-rings and special seals for hot water, steam and water-based applications. A 112-W is a cast natural polyamide usually referring to Nylon or to PA. The material has very good physical and chemical properties and is used in a wide range. Thanks to the high moisture absorption capacity, which leads to swelling and loss of good properties, we do not recommend its use in water. Main application: Support, support, guide rings, scrapers, bushes, machine parts. T 101-W is a pure PTFE (polyethyl fluoroethylene) usually called Teflon or TFE. The material has exceptional chemical properties and the lowest of friction coefficients. The wide temperature range - 200 to + 260 ° C and mechanical properties makes the T 101-W a versatile material with many applications. T 101-W should not be used for dynamic applications in water. Main application: Retaining rings, roof sealing rings, low-tension guide rings, O-rings, corrugated sealing rings, flat rings. T 105-G is a polytetrafluoroethylene filled with 15% glass and molybdenum sulfide. 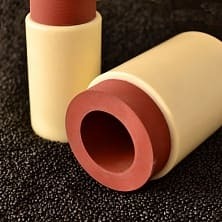 Fillers make the material more resistant to "cold flow" and gives particular properties when used as a composite seal with support for high pressure strength. 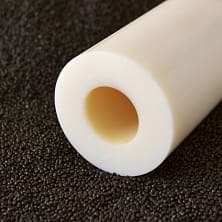 It has similar chemical properties and can be used in the same temperature range as the original PTFE, which makes it a universal sealing material. T 105-G should not be used for dynamic applications in water. Main application: O-rings, slip rings, pressure rings, retaining rings, roof sealing rings, guide rings, spring and elastomer seals, high and low temperature applications and where chemical resistance and low friction are required. T 125-C 25 is PTFE (polyfluoroethylene) filled with 25% carbon. Fillers make the material more resistant to the so-called "cold flow" and gives special properties when used as a composite seal with support for high pressure resistance. 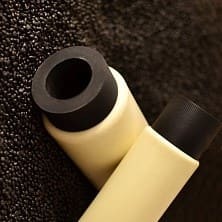 It has similar chemical properties and can be used in the same temperature range as the original PTFE, which makes it particularly useful for rotary seals. T 155-C 25 should not be used for dynamic applications in water. Main application: O-rings, slip rings, pressure rings, retaining rings, roof sealing rings, guide rings, spring and elastomer seals, high and low temperature applications and where chemical resistance and low friction are required. 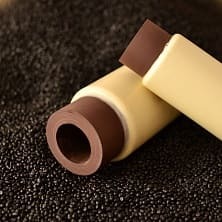 T 110-BR 40 is PTFE (polyfluoroethylene) filled with 40% to brown. Fillers make the material more resistant to the so-called "cold flow" and gives special properties when used as a composite seal with support for high pressure resistance. 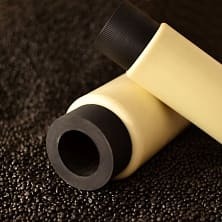 It has similar chemical properties and can be used in the same temperature range as the original PTFE, which makes it a universal sealing material. T 110-BR 40 should not be used for dynamic water applications. Main application: O-rings, slip rings, pressure rings, retaining rings, roof sealing rings, guide rings, spring and elastomer seals, high and low temperature applications and where chemical resistance and low friction are required. T 120-BR 60 is PTFE (polyfluoroethylene) filled in 60% to brown. Fillers make the material more resistant to the so-called "cold flow" and gives special properties when used as a composite seal with support for high pressure resistance. 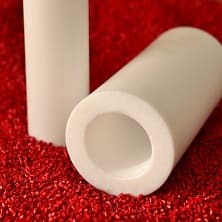 It has similar chemical properties and can be used in the same temperature range as the original PTFE, which makes it a universal sealing material. T 120-BR 60 should not be used for dynamic water applications. Main application: O-rings, slip rings, pressure rings, retaining rings, roof sealing rings, guide rings, spring and elastomer seals, high and low temperature applications and where chemical resistance and low friction are required. On request, we can offer various special materials for specific applications.